Today, a dream is coming true. I know, it might sound a little cheesy, but three years ago, I crossed the finish line of my first half marathon…and my life forever changed. I went into that race with a plan I found on the Internet, a yucky cough, and no training run longer than 8 miles. Back then, there weren’t tons of Facebook groups (or at least, I didn’t know about them) that helped with all those pesky questions about races, I didn’t know anyone that ran (personally, anyway) and I felt, well…alone. Still, I bottled up that exhilaration that I felt as I exited Epcot that first runDisney race, and little by little, found more training tips, connected with like-minded individuals and discovered that I loved racing just as much as I loved running, a fact that not only showed in my finishing time (that year, I took my 13.1 time from a 2:04 to a 1:48) but in my heart. Now, this might be an odd story to preface today’s announcement, but here’s the connection: you see, so many things have changed in my life since I laced up my running shoes for the very first time in the summer of 2010. I still consider myself a newbie runner in many ways, and I think of that only as a positive – I know what it’s like to start from nothing, I can still feel that nervousness from my first race, I truly believe there is no such thing as a stupid question, and above all, I want to share and celebrate it all with YOU. Visit my 26.2 with DONNA Fundraising Page and make a donation (Express = $22.50, Resort = $90 and Epcot = $135). With this structure (offered in this first wave of registrations), 90 percent of your coaching fee will be used to help FINISH breast cancer! How soon can training plans begin? The earliest consultations/training plans will be scheduled for the week of February 3 and beyond. What if I want to train for something later this year? Should I register now? If you’re planning on a fall race, or maybe even something next year, this is your call. However, I will definitely hold your place if you want to “lock it in” and if you choose to register now, your donation fee is tax-deductible. If I choose “Express” but then want a plan later, do I get a discount? Do you offer services “a la carte?” “Upgrading” or adding to a package is done on a case-by-case basis. I definitely want to keep services affordable and available, so I’m happy to work with you on these sorts of situations. Do I have to use a credit card? For the sign up process, yes. If you absolutely cannot use a CC, contact me and we can work something out. For the donation process, you can write a check to 26.2 with DONNA / 11762 Marco Beach Drive, Suite 6 / Jacksonville, FL 32224 if you prefer. Do I need a coach? This depends! I think everyone can use a little extra help and support, and I’m glad to be in your corner; as a coach, friend, or both. If you need a little push, a taste of reality, or simply more structure, a coach can be very helpful. 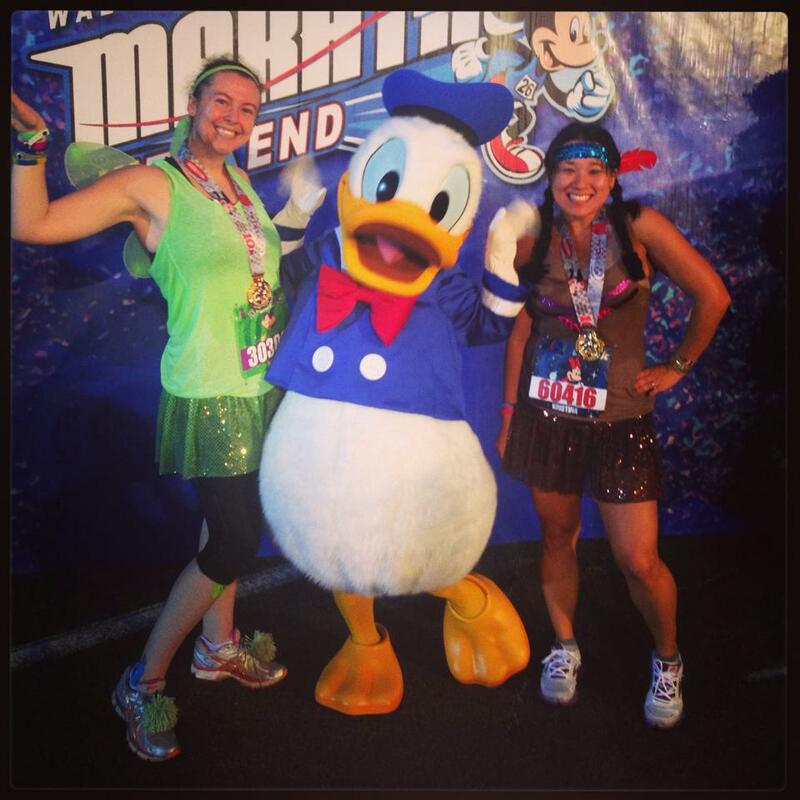 Do you only coach for runDisney events? No way! My love for endurance events began with the WDW Half Marathon, but there are so many fantastic events out there and I am excited to help you train for what works best for you. Excited, but have questions? Comment below or email me at khiguchi at gmail dot com. *Note: after 2/23/2014, all payment will be processed through payment page. 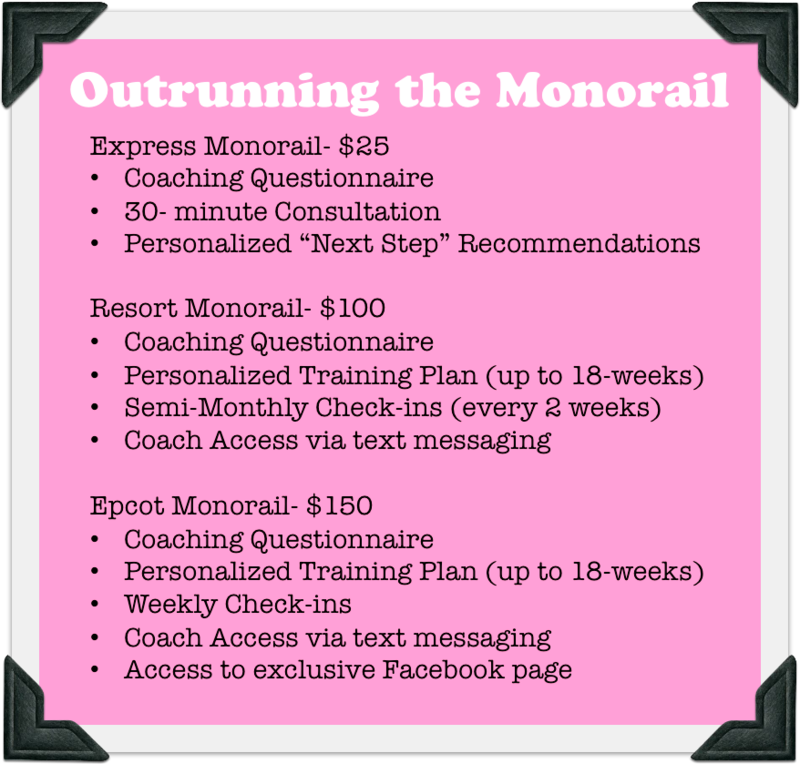 The Resort Monorail option includes “Bi-Monthly Check-ins” (every 2 months). I think you might mean “Semi-Monthly Check-ins” (twice a month). You will be a great coach, wishing you every success! Thank you, Rick! That one always confused me, I will correct that ASAP!!! I appreciate your support and encouragement, A!!! Exciting! I’m sure you’ll do great with it! Thanks, Karla! Thanks for always being an incredible chEARleader and friend!! Not cheesy – AWESOME. You are incredible. KEEP GOING. I love this. I’m glad our (e)-paths have crossed and I’m looking forward to seeing this wonderful program garner some much deserved support! Thank you so much for your kind words and constant support, Dylan. It really means a lot! !